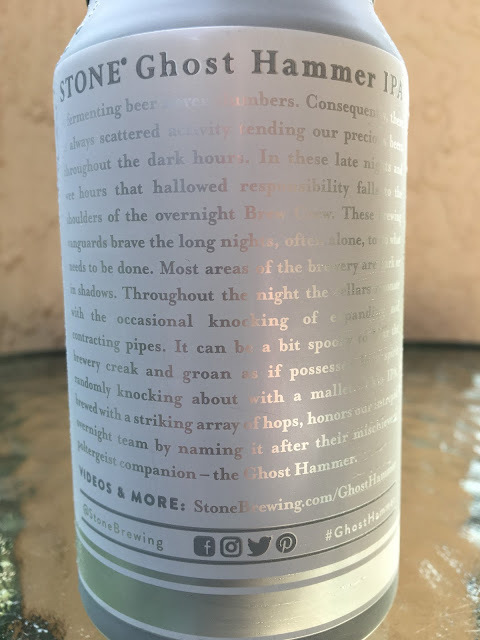 Another Stone Brewing IPA? No Way! 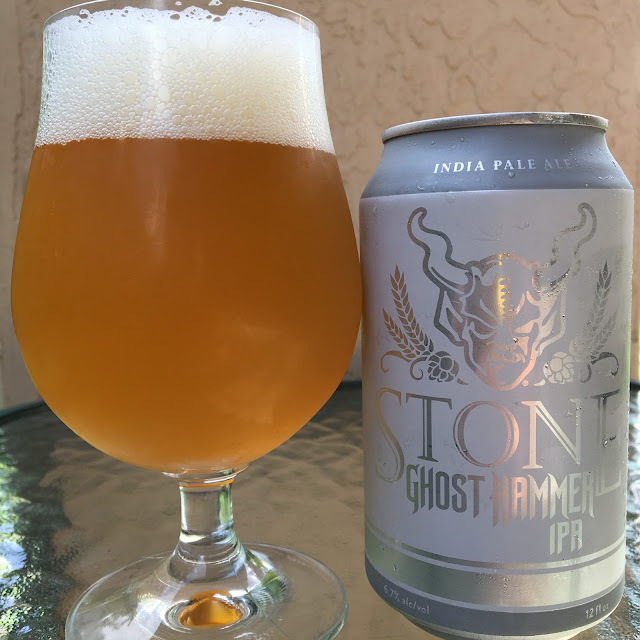 Stone recently released Ghost Hammer IPA in honor of their overnight crew. You can read the story on the back of the can, but the silver and white contrast with a lot of reflections will probably drive you batshit crazy--just click that link and read it on their website. I'm pretty sure that's what the Stone marketing department had in mind anyway. But I digress... Basically, The Ghost Hammer is the name of the mysterious and "mischievous poltergeist companion" that roams the nighttime brewery making "weird ghostly sounds" and keeping the staff on their toes. Canned 05/24/17. Released 06/05/17. Consumed 06/17/17. 6.7% alcohol. 56 IBU. Orange and Tang (yeah, like the astronauts drank) aroma, tangerine citrus, bright. Very juicy flavors: tangerines, orange, tangy. Sweet to start but enough underlying hoppy bitter answer. And while leaning bitter overall, this isn't really very bitter or hoppy at all for this brewery! Tasty though I prefer Stone IPA and many other of their hoppier offerings. One of the most tame and balanced beers I've ever had from this brewery! Good beer. Good story. A standout amongst the most manageable and adjusted lagers I've ever had from this bottling works! Great brew. Great story. Thanks for sharing.